How To Buy The Right Underwear For Your Body Type Are you tall and thin? Maybe you’re short and stout. 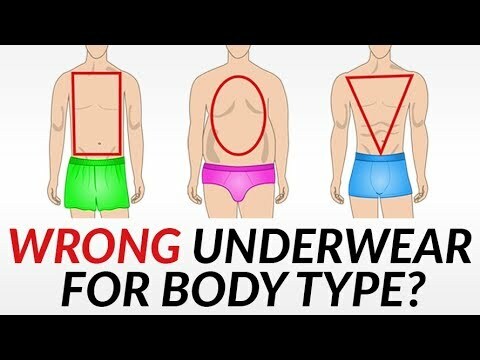 Gentleman, it doesn’t matter because in today’s video, I’ve got you covered – how to buy the right underwear style for your body type. Guys, let’s start this video while I’m talking about the five body types and the four underwear styles we’re going to cover in today’s video. So, the first body type, we’ve got the big man. Okay. So, you’ve gained a bit of weight in and around your midsection area, you are a heavier guy. No getting around this. I’m going to talk about the different styles that are going to work for your body type, Next up, we’ve got the gentleman with the wide hips. Oftentimes, your hips and the weight that you’ve accumulated around that area is going to be bigger than your shoulders. Oftentimes, also on your shoulders, you’re going to have a bit of a slope. Next up, we’ve got the muscular man. So, you spend a lot of time in the gym, you have a strict diet with a lot of protein and it shows. You’ve got larger arms, you’ve got thicker thighs, and your waist area is actually really trim. Now, when it comes to jeans when it comes to shirts, you have trouble finding clothing. But, when it comes to underwear, I think you’re going to be surprised by what I’m going to be able to suggest to you. Next up, we’ve got the fit man. You’ve got a lean diet and you take care of your body. You’re in great shape, you just don’t have as much a muscular build up. Clothing is sometimes a little bit easier to find. Now, with underwear you’re going to find that’s no different you’re going to enjoy what I’ve got to say in this video. Rounding this off, we’ve got the thin man. Now, clothing for you can be difficult to find at times because, hey, you’re just a skinny guy and a lot of clothing is made for people with more weight. You’re going to – actually, I’ve got a few suggestions for you that you’re going to enjoy. Now, let’s talk about the four underwear styles. First up, we’ve got boxers, very easy to spot by their overall loose fit and the size of the actual underwear. Now, boxers a lot of guys swear by them. They love them they feel it’s just like going commando and that’s also the negative is there is no support with boxers. Next up, we’ve got boxer briefs. Very similar in their coverage area to boxers, so they’re going to cover the top part of the thigh, they’re going to fully cover the buttocks, they’re only cover the front crotch area. But, that’s about where the similarity ends because boxer briefs are much closer fitted and they provide support. Next up, we’ve got trunks. So, what we’re going to see very similar to boxer briefs except they’re going to provide less coverage. They’re going to fully cover the buttocks, but they are not going to cover the thighs and they’re going to provide support in the crotch area. And rounding this out we’ve got briefs. So, briefs are going to have the least amount of coverage. They’re not to cover any of the thigh they are sometimes not even going to fully cover the buttocks area, but they are in the crotch area going to provide support. Guys, throughout this video, you’re going to see some amazing looking underwear. You can grab it over at Tani. I’m going to link to them down in the description. They’re the paid sponsor of today’s video and a great sponsor. For two years I’ve worked with Tani. And if you want some of the best underwear in the world, you want to go check out Tani here’s why. So, you’ve heard a Micro Modal, but if you heard of Micro Modal Air, Micro Modal actually came out in the 1980’s. It was actually slightly better than silk, had a very nice hand. It’s a great fabric. But Micro Modal Air has come out recently and it puts — it is the new step and that’s what I love about Tani is when it comes to fabrics they use Swiss cotton, they use Micro Modal Air, they use all of the latest — I mean, this is top of the line. We’re not talking technology that’s 20, 30 years old. They are at the cutting edge, so if you want the best I have never felt underwear that is as smooth as this Micro Modal Air. When it comes down to it, I know Adam the guys over at Tani, they come out to my conference they’re the real deal. And, a two-for-one deal. Guys, you’re not going to see this elsewhere, this is a limited time offer. But you can grab two- for-one because I know a lot of you guys are on the fence, you’re like is it really that good. I can tell you once you go Tani, you are not going back. It’s — it’s difficult, I actually had a pair of — I’m not going to say them. They are, you know, one you can get it at a big-box store. I don’t know how it ended up in my underwear drawer, but when I tried them on I was like this is like sandpaper, I’m not going to — I should go back to my Tani. So, guys, great company. Go check him out. I’m going to link to them down below. Grab them, two-for-one, you’re not going to find a better deal. First body type I want to cover is the big man. And, of all the body types out here, I think underwear choice is most important for the guy that’s carrying excess weight that has really thick big thighs. Why? Because I know the pain, you’ve written to me about this that you basically get sores, you get, you know, chafing. You just have issues with your skin rubbing up against with the clothing rubbing and it’s just rough, so you want to make sure anything you have up close to your body fits you perfectly and has the best fabric that you can afford. So, first off, look to the boxer briefs. I think that those are going to do a great job. They’re going to give you plenty of coverage. So they’re right in your thigh area, they are going to provide just that extra material right there so that you would rub the material not your actual skin, that’s very key. Also, around the waistband you want to — you’ve got to get that right. If it’s even slightly too tight, it’s going to end up leaving to sweating which could lead to sores which can lead to other types of, you know, rashes and things. You don’t want that to happen. Boxer briefs especially those that are breathable made from good fabrics are going to be the perfect choice for you. After that, we’ve got boxers. I know some guys swear by boxers and they do a good job especially, again, when made from a nice luxurious fabric that is going to protect basically your crotch your buttocks area your upper thighs from chafing, that’s what you’re looking for. Now, when it comes to briefs and trunks, I know some guys are going to swear they love their briefs. They’re a big guy, but they find that briefs just basically do a good job of working with their body type. I say to avoid them the reason being is you’re exposing too much skin to actually rubbing up against each other. Now, some of you guys have kind of become immune to this maybe it’s something you’ve got powders or things that you’re using, but I would say maybe by looking at a different underwear style, you could avoid having to use that. Next up, I’ve got the wide-hipped man. So, a lot of this stuff I just talked about for the big man is also going to apply to you especially if you carry excess weight. But, let’s say you’re a wide-hipped guy and you don’t have the excess weight, you just have wide hips. Well, in that case, you can look at trunks. Yes, trunks will work for you. I still think boxer briefs are going to like with the big man be your best option. It’s going to be the fitting closer to your body giving full coverage and support that’s going to work for you. Now, when it comes to trunks, I’m going to say no on trunks. Well, mostly because of just simply the way that they look on you. They’re just going to make your hips look even wider your shoulders look even smaller and that’s not the look you’re going for especially in the bedroom. But, if you don’t — if your wife has no issue and you love trunks, then go for it, just ignore my advice. And now, let’s jump over to briefs for the wide-hipped man. I would say avoid them and it’s simply going to be it’s just going to not, again, it’s more of an aesthetic thing. If you are a thinner guy, you could pull off the briefs, if you’re a bigger guy and you’ve become accustomed to it. But, I do think that a man should have coverage, so that he prevents chafing and just things, you know, not rubbing in the wrong way. Next up, we’ve got the muscular man. Functionally, you can wear any of the underwear types we’ve talked about, they would all work fine for you. But, I think that boxers are going to be the least flattering and should be avoided. I get it though, some guys love the freedom they’d — I don’t need the support I just love the way I feel free and my boxers, go for it. But, you spent a lot of time in the gym, you’ve taken care of your body, why not wear something that shows it off. Boxer briefs, well, you guys probably know are my favorite I think they work out great they provide a lot of coverage. But if, you don’t want the coverage you want to fully show the world what you’ve got, then look at the briefs look at the trunks either one will work for you. Next up, we’ve got the fit man. So, functionally like the muscular man, you can wear any of the underwear types we talked about, but boxers in my opinion are going to look worse on you than even the muscular man. The reason being, the muscular man he’s got a larger chest he’s got larger arms. For you, the boxers are just going to make you look thin. That’s not what you’re looking for, you take care of your body you’ve got a thin strong build and you want to be able to show that off. Again, boxer briefs are going to look great, trunks are going to look fine, briefs are going to look good as well. But, why would you want to go with briefs? Why would you want to go with trunks versus boxer briefs in this case? Well, let’s bring in height. Now, height I haven’t talked about too much in all these body types. But, understand if you are shorter let’s say you’re 5’4”, you don’t want to be wearing necessarily boxer briefs. Yes, they’re my favorite, but for a shorter man they can — they can just look a little bit too big on you. So, in that case you would want to wear briefs you would want to wear trunks because they’re going to work better for your height. Finally, the thin man. So, for the thin man, you want to avoid the boxers. They just are going to always look too big, they’re – in fact, they’re going to fall off and in fact they may fall off because, yeah, you’re just a thin guy and for you you want something that’s going to fit closer to the body – boxer briefs, trunks, briefs. Now, in some cases I would think especially if you’re a taller thin man maybe briefs are just going to be a little bit too tiny. It’s going, yeah, look like a string bikini on you, so you maybe want to avoid it there. I think trunks look great on thin men better than almost any other body type, so that is your advantage is that you could go to trunks. But, as you guys know, I love the boxer briefs, so I’m going to say boxer briefs for you as well. All right, gents, now it’s your turn. Let me know down the comments agree, disagree, what would you have changed in today’s video. And if you want to see that chart which I break out the body types the underwear styles, I’m going to link to it down in the description. It’s going to the support article where in the support article I go into a lot more with each body type the underwears I chose why we choose them. And, I love hearing from you guys down in the comments. And, if you want to grab some great underwear, two-for-one deal. Tani, it’s a great company. For over two years I’ve worked with Adam and his company. Amazing company. And it’s not just about underwear, their undershirts I have to say are — I wear these sometimes just like a regular t-shirt.